This was my Shas&#39;el that i used for Conflict. I&#39;m quite happy with the paint job overall. Which i had 1 day to complete it in. The conversion is my favourite part. Wow, you did it again Gareth . When I first saw the model unpainted, I just thought it looked good, but not up to the usual Gareth standard. However, I have now changed my mind . All though, I must agree as Khanaris said earlier, the fb looks a little odd. And just curious, is that foot just pinned? Completely insane. I absolutly love it. The painting is perfect. The lighting effect is really well done. I thought it was made in photoshop at first! The color sheme is very very nice. Light effects -&gt; HOLY ... Are these real? Man that is the best part of the model. Its insane. P.S. BTW dude, (Off topic) how did it worked out in tournament? Its a Sunforge Shas&#39;El right? I just wonder how did it performed on a table? Seriously sweet work on the shield & the joints. 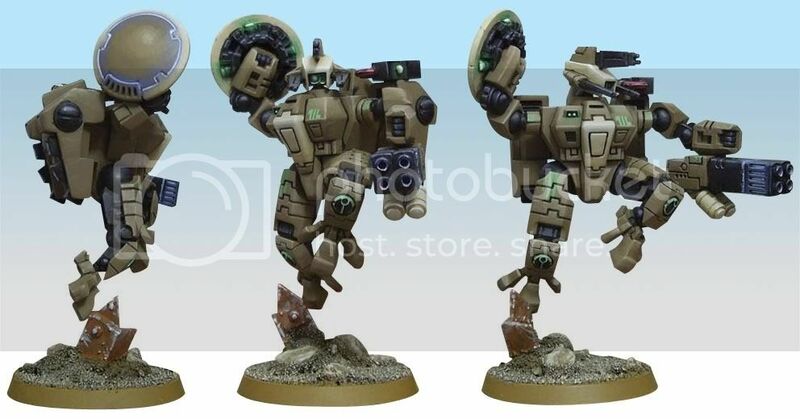 The only criticism I would offer would be that it seems the fusion blasters didn&#39;t receive nearly the kind of attention the rest of the model did. If you went back and made them like your shield, this puppy would be utterly solid. Very nice... You painted that is just 1 day !? Gareth.... seriously man, you do this to spite us dont you? I&#39;m loving this stuff Gareth. Especially the shield. How did you get that awesome glowyness there? The only bad point is the fusion blasters, they aren&#39;t quite dynamic enough compared to the rest of the model. Perhaps if a chunk had been taken out of the middle of them, and the arm placed in there (like with the shield). Otherwise, hot stuff, really great. Perhaps if a chunk had been taken out of the middle of them, and the arm placed in there (like with the shield). I agree with this idea... ah the benefit of hindsight. I won&#39;t be changing it, but i&#39;ll bear it in mind for the next one.